Here are some photos of how our Cedar Log Swings compare to what else you're seeing online. Like what you see? Check out our Line of Cedar Log Swings! Some key notes to look for when purchasing an outdoor wooden swing. Notice the difference in size of our 2 Cedar Log Swings compared to the swing in the middle, the middle swing is the same size swing you would normally see from our competitors. What is the species of wood that product is made from? White Cedar is what we make our log furniture from and it can last up to 25yrs + in the outdoor elements. What kind of hardware is used on the outdoor furniture? We use only zinc coated hardware which can take the elements that it will face outdoors. Plus we have our own custom made U- Bolt system, that actual has 2 pivot points that make the swinging motion effortless. How large of a diameter are the logs and dowels? 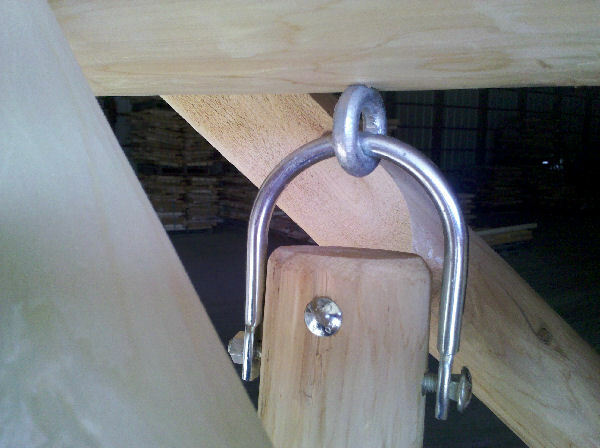 On all of our log furniture we use dowels that are 1.5" in diameter. The log diameters range any where from 3" to up to 5.5" unlike many of the log swings you see online that do not get past 4" in diameter. What is the weight of the outdoor swing? This is more important than what most think. Because the cheaper smaller swings out on the market are smaller and lighter they are more likely to be damaged by the wind blowing them over. Most swings on the market are any where from 100lbs to 160lbs. Our log swings are about 225lbs to 250lbs+. Does the outdoor swing have straight or contoured seats? Our swing does have contoured seats that will fit you comfortably. Who handcrafted this outdoor swing and how long have you been doing so? We are not a middle man selling this swing, we handcrafted it from start to finish and have been doing it for over 35yrs. Take note of the 2 pivot points that is in this swinging system. Where the u bolt goes through the eye bolt. Where the u bolt is attached at the bottom with the carriage bolt.